Latvia's Friend: Can you buy yarn in Riga? Can you buy yarn in Riga? Finally someone asked me a question! In a later posting, I’ll offer some suggestions about shopping in Riga and ideas for gifts to bring home. You will see lots and lots of hand-knit mittens and socks for sale throughout Vecriga, but I believe I’ve walked every cobblestoned street in that section of the city and can state categorically: there is not a single yarn store. I turned up two mildly interesting stores (not far from our hotel), a tiny shop that carries a limited stock of local Latvian yarn as a sideline amid suvenīri, and I saw on the bus but not did not visit one other on the highway heading out of town. That’s it—other than a couple stalls at Central Market on Saturday mornings (too early for most of us to have arrived). Bottom line: You will probably be disappointed if you decide to wait to buy the yarn for any of the trip projects in Riga. Both Lia and I have hunted for yarn shops during several extended visits to the city. The following shops are the only ones the two of us found—or even heard about. We suspect a conspiracy: those knitters who turn out the mittens and socks for the souvenir vendors don’t want to share their wool! Dzija (this means “yarn” in Latvian and that is the only name I saw on the sign outside this shop). Located at 11 Merkeļa (middle of the block between Barona and Marijas across the street from the Russian circus), about 3 blocks from our hotel. The yarn shop is downstairs in the basement. Most of the yarn is Italian, but they have good prices and a large inventory. Several bins are filled with bags of 10 or more skeins at bargain prices. I also got small steel double point needles here (size 0, 00, and 000). The staff is Russian and so are all of the knitting magazines and patterns. If you have been looking for a quantity of yarn to make a sweater, bring along your pattern because this might be a good place for you. Adele. Located at 30 Gertrudes (middle of the block between Terbatas and Barona, 5 blocks from the hotel). The shop is street level and sells both yarn and yard goods. Some interesting yarns, but all of them are imported mostly from Italy. Patterns are in Russian and German. I didn’t see many bargains. It’s a smallish shop and not nearly as well stocked as what true yarn lovers consider “a find”. 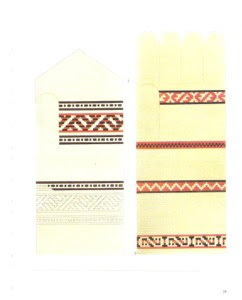 Dāvanu dizains (“Gift design”). Located at 1 Inženieru, a 1-block long side street between Merkeļa and Raina next to the main building of the University of Latvia. This is a teeny souvenir shop that only carries Latvian yarn as a sideline. You can see in the window from the street, but you have to go into the building to reach it. I bought some of the yarn. It comes in 100-gram (unwound) skeins, 100% Latvian wool, light sports weight, just right for mittens, bags, and socks and costs LT 1.10 (about $2) per skein. BUT there were only a few colors and a grand total of only 20 skeins in one pigeon hole. I got the card and e-mail address, and I plan to write to the manager, telling her some serious knitters will be in town on Monday, July 30, and encouraging her to stock up on that yarn from Limbaži. It was well spun. Illustives. I haven’t visited this one, only saw it from the bus window on the way out to the Ethnographic Museum (which we will be visiting Sunday morning). The address is 390 Brīvības (definitely not walking distance). If possible, I’ll try to check up on it before you all arrive and see if it’s worthy of us. That’s it. Arnhild asked me to make a full report since she says knitters will always go looking for yarn even when you warn them there are no great yarn stores in the town. I’ll be happy to show you where these few are. They all should be open all day Monday (from 10 am until we leave for the ferry) but not Sunday. 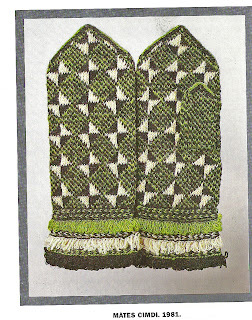 Fragments of mittens unearthed during archaeological digs prove that mittens have existed in the Latvian region since the 15th century. Knitting needles have been discovered even in the 14th century layer of excavations. The artist’s rendering shows the oldest remains of a 15th century mitten and glove found in excavations in Riga and restored by the archaeologist Anna Zariņa.